Dart has been a spirit creature linked to the village via a shrine of Sylvanus. He has watched over the town for over 200 years and helped quell minor problems in the village, but does so secretively. He has been searching the village for his true purpose, and he is beginning to see it in adventuring with his new half-orc friend Tarak. 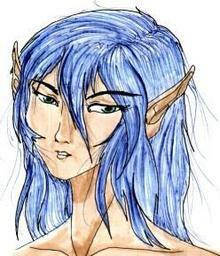 To most of the town, he is a handsome elf with hair strangely colored like a swallow’s breast. While he has been seen as a bird from time to time throughout the village, only a few people know of his shapeshifting abilities. He has developed great wisdom over the years and enjoys relaxing while smoking his pipe inside both taverns of Ravenwood.